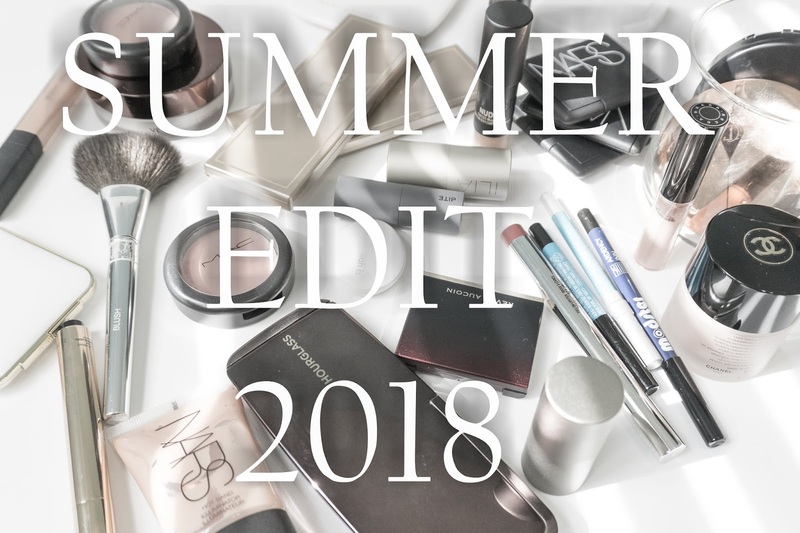 I am almost a month late in posting the Summer Edit, but in my defense, I had a crazy messy and busy June! Better late than never! We still have two plus months of summer and heat in front of us. So here we go! 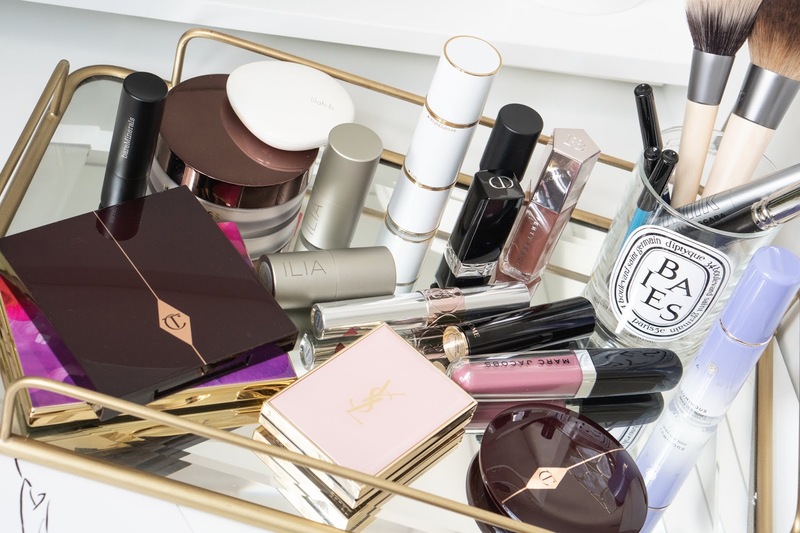 I stick to similar base products as Spring Edit and just swapped a few makeup bits and added a few extra essentials. Sun protection tops the list in summer. 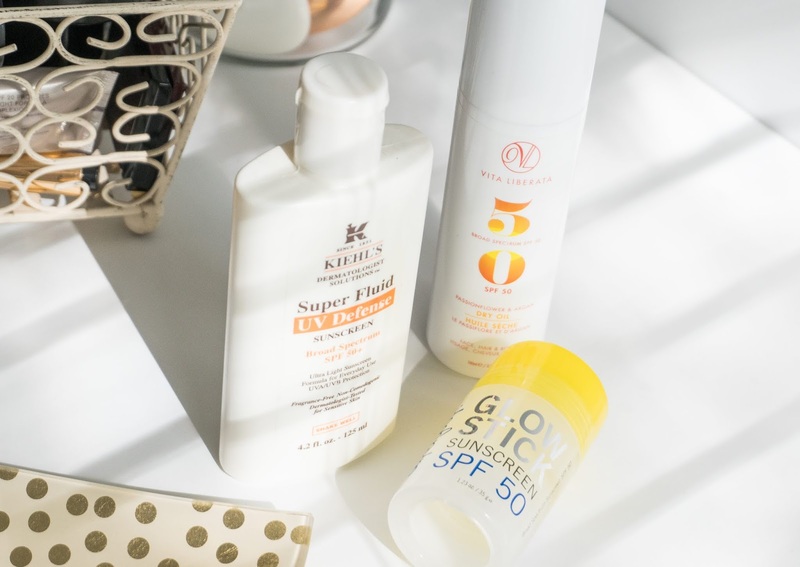 Well, it is something that should ideally top the list every season, but in summers my sunscreen game is top notch! Love the VITA LIBERATA Passionflower and Argan Dry Oil for face and body. It is fantastic. It has an SPF 50 and does not leaves any white cast on application. Quick to apply all over the body. It is a dry oil, so it is not at all greasy. Does not makes the body shiny or oily. For the face I like KIEHL'S Super Fluid Daily UV Defense Sunscreen. It is an oldie but a goodie. Does not leave any white cast, does not clog pores nor makes me look greasy. I have been using it for a while now. I do want to venture out and try some gel sunscreens though. Probably my next purchase. I did recently picked the SUPERGOOP! Glow Stick Sunscreen SPF 50 and so far it is working amazing. The key is to apply lightly or it can get really greasy ans shiny. I don't wear it under makeup. Also, Charlotte tilbury Magic Cream is another product that I use primarily in the evening under makeup. It is everything. I have talked about it million and one times and there is a review too on the blog. Also, it has SPF 15. 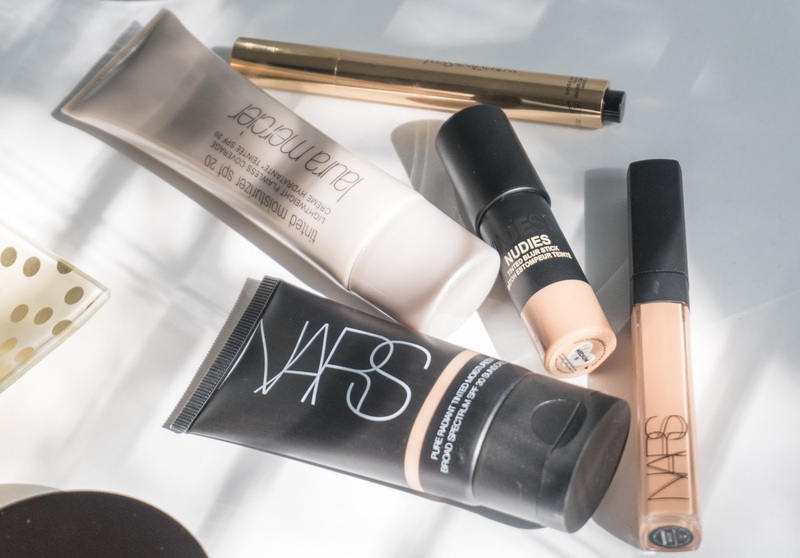 For the base, it is either NARS Pure Radiant or Laura Mercier tinted moisturizer and both these products have SPF in them. 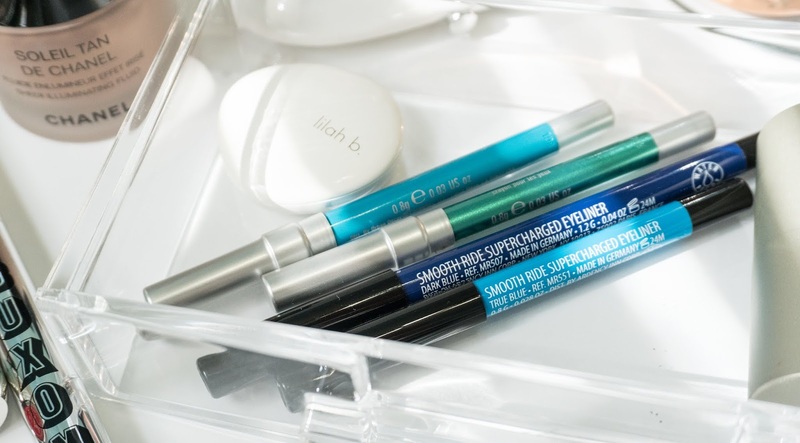 These give light to medium coverage, do not clog the pores and lasts the whole day. They don't oxidize on me nor make my face look patchy or uneven. I have found my perfect shades in their line and they just work fantastic. This is a new product and I find myself liking it a lot. I would say it is a tinted primer. Very light weight and smooth in texture. It does not blurs too much but somehow it does make a difference on the skin. Evens out the skin tone, without actually providing much or any coverage. It blends beautifully and creates this even base. Never completely dries down. I actually wear it by itself when I am not bothered to do anything with my face. The only problem is the stick. Mine came broken and for a product this creamy, I don't think that packaging is great. Gets messy. The concealer is standard NARS Radiant Creamy concealer and the brightening YVES SAINT LAURENT TOUCHE ECLAT Radiance Perfecting Pen. I don't mess much with my holy grail base products, because it is a nightmare to find the perfect color match! So once I know what works, I stick to it. Apart from the Charlotte Tilbury Air Brush Flawless Finish Skin Perfecting Micro-Powder, MAC Mineralize skin finish Natural always stays in my bag. It is a fool proof powder that is light weight, has medium coverage and is not flat matte. This year I added HOURGLASS Veil™ Translucent Setting Powder. It is a new purchase. It is not flat matte and I find it a little glowy for the day time. I enjoy it a lot for the evenings to set the makeup. Also, it is a loose powder and I find it little messy. 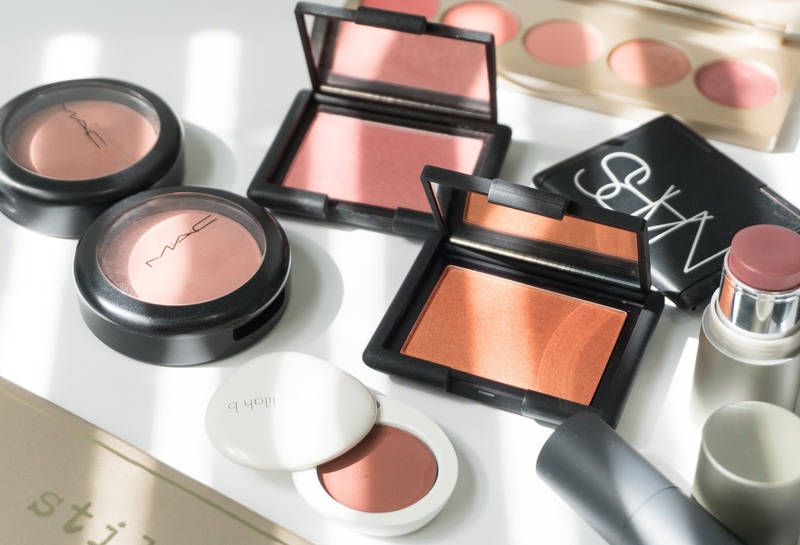 Bronzer, the real summer makeup! I use Bronzers to even out the uneven tan. They just warm up the face and makes everything look good and even. I have a few favorites that I use in rotation. MARC JACOBS BEAUTY O!Mega Bronzer Coconut Perfect Tan in 104 is a good matte Bronzer. It has no shimmers. It blends beautifully and is so close to my after tan skin tone, that it just looks very natural. 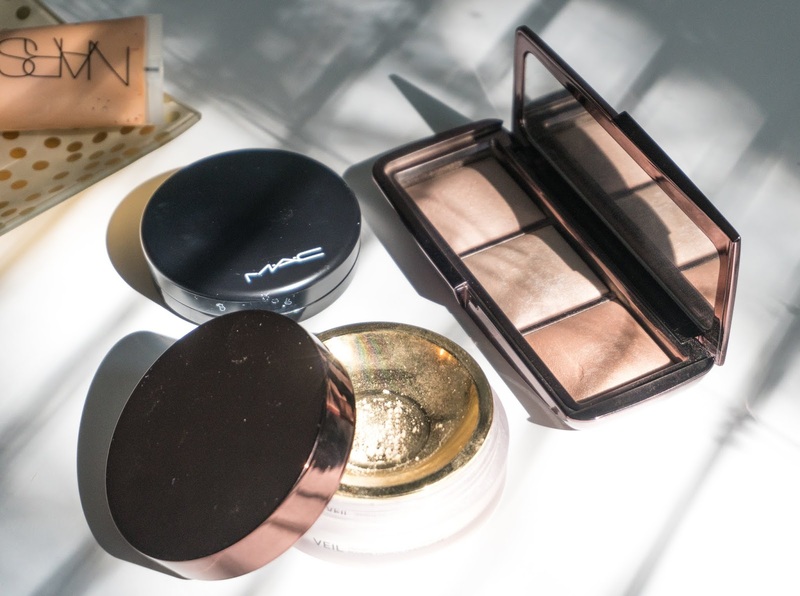 For the shimmery bronzer, I stick to Hourglass Ambient Lighting bronzer or the Tom Ford The Ultimate Bronzer in Gold Dust. The Gold Dust is such a gorgeous shade. 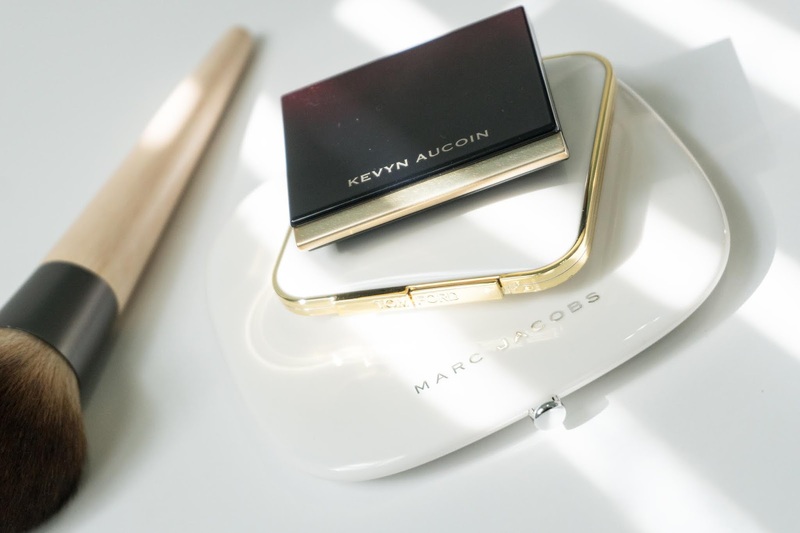 The only cream bronzer/contour type product that I have is from Kevyn Aucoin. It is a cream contour duo. Cream bronzer is a territory that I need to venture more, because I enjoy using cream products a lot! If you have any suggestions for good cream contour/bronzing product, do let me know. 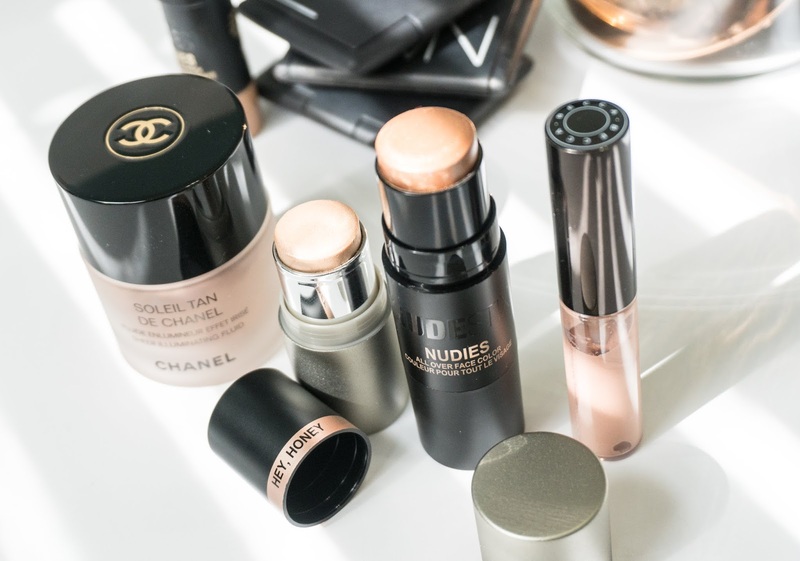 It is all about the glow! In summers, warm glow is everything! 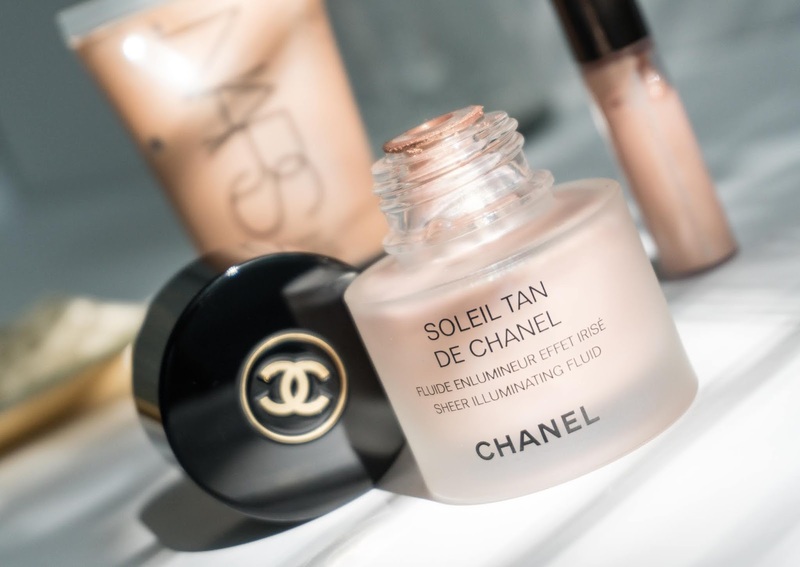 and nothing beats my all time favorites is CHANEL SOLEIL TAN DE CHANEL Sheer Illuminating Fluid in Sunkissed. There is a fine line between glowy and greasy and this one never never makes me look greasy. The colors is just fantastic and compliments my skin tone very nicely. NARS Illuminator in Hot Sand is another lovely product to mix in foundation, lotion or to apply on its own. 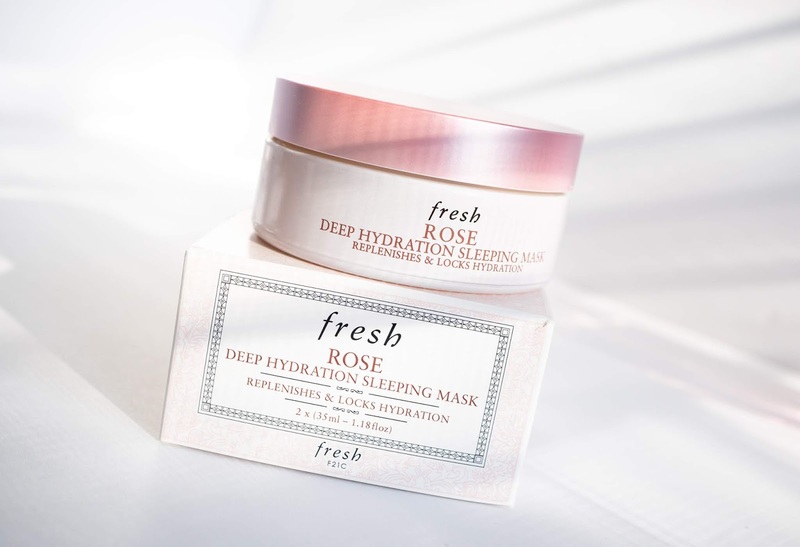 These two help in achieving that beautiful glow on the skin. 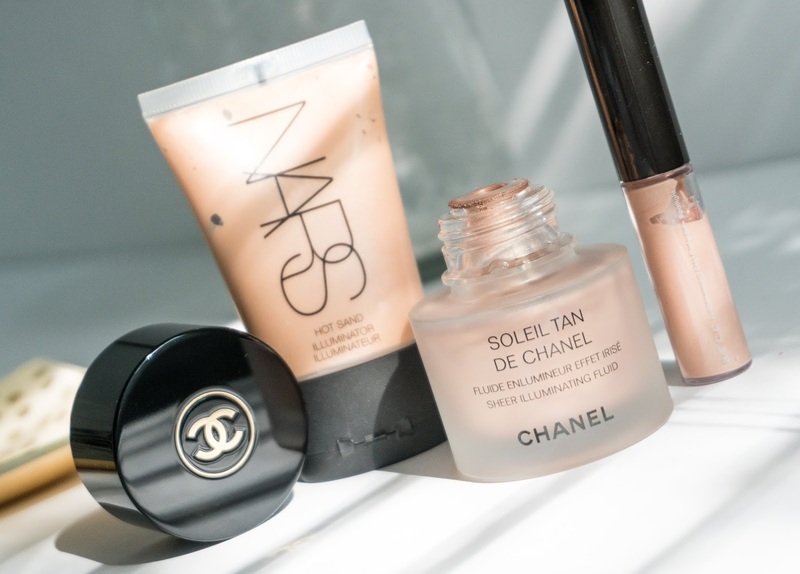 For Highlighters, I prefer creams over powders for that glowy, dewy look. Especially for the day time. I find these give me the most natural glow. Few favorites include the NUDESTIX Nudies All Over Face Color Bronze + Glow in shade Hey, Honey! I love the color more than the texture of this one. It is more of a bronze, warm glow than your usual glow. Ilia Illuminator in Cosmic Dancer gives the best, subtle, slightly wet looking glow and the color is the perfect for my skin tone. It is neither too white, nor too yellow. It has golden undertones, but not yellow gold. The base is not too pigmented, so it is more like glow without pigment, if that makes any sense. RMS Beauty Living Luminizer is another good one, but is tad oilier in texture. I love that texture, but I would prefer the warm shade of Magic Luminizer over the cult classic one. For Powder Highlighter, I just have my usual Becca Shimmering skin perfector in Opal. 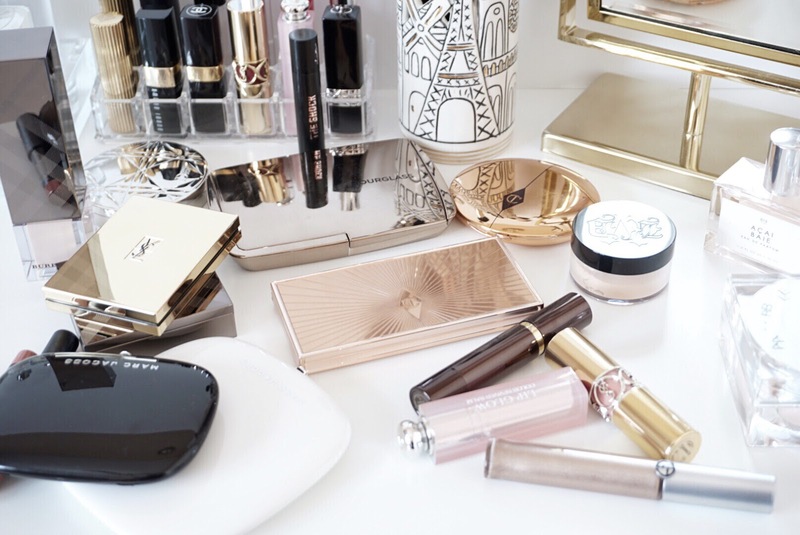 To bring everything together there is the trusted Hourglass Ambient Lighting palette. I always have this one handy. For powder blush there are just three that I have picked. All from NARS. NARS Luster (I swear by this! Nothing makes me look as amazing as this one!) MAC Warm Soul is pretty similar to Luster, but I don't have it anymore. NARS Torrid and Taj Mahal are the other two. These colors flatter my medium, warm, olive golden skin the most. I enjoy using it in the evenings. I choose MAC Powder Blush Melba or Gingerly if I want something matte. There are so many choose from, but I stick to the summer color palette. Both brands make amazing quality blushes. Beautiful shades, long lasting and easy to work with. These are the most used ones. While I do love all my cream blushes, currently ILIA Multi-stick in At Last, Lilah B Divine Duo™ Lip and Cheek in B. Lovely are dominating. These are wonderful. The colors that I have are very summer appropriate. Ultra creamy, very easy to blend, goes on smoothly and looks super natural. Very easy for touch ups too. I love the texture of both Ilia Multi-stick and Lilah B, though the pebble like packaging of the later is simply gorgeous! Stila Convertible color are my all time favorite. I like them in the the palette form because of all the colors to choose from! 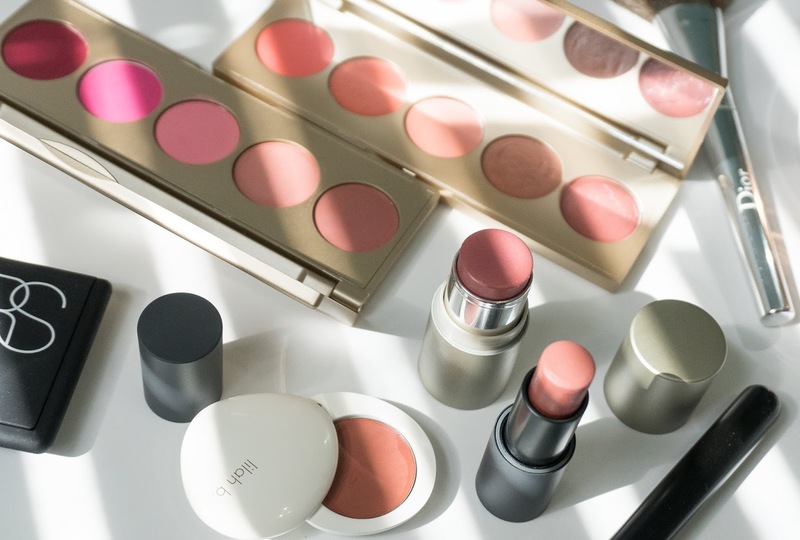 I also enjoy the Bite Beauty Multi-sticks and they were featured in Spring Edit as well. Colored Eyeliners. For the eyes I just add any fun colors of eyeliners. Love Urban Decay 24/7 Glide-On Pencils. Few shades from Sephora and Ardency Inn Brands. These don't irritate my eyes. Blue and Teal shades are my favorites. MAC Lipsticks are lovely. Long lasting and affordable. MAC Luster finish is my favorite finishes of all time. See sheer is a shade that is so lovely for summer. It is a perfect coral pink that is neither too pink nor too orange. I repeat it every year. Just perfect and who could say no to the classic MAC scent. Another all time favorite my lips but better shade is Brooklyn from Buxom. Kaplan MD sent me a beautiful Lipstick that has SPF 30 and the color Sunset is such a gorgeous one. 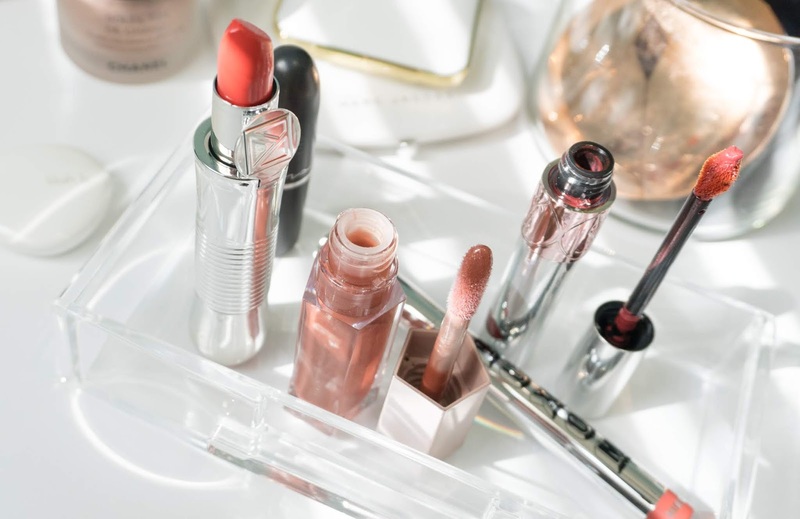 I hardly wear orange or red lipsticks and this color is so orange-red blend, but it is not crazy pigmented and leaves this lovely, fresh stain on lips like you have just eaten orange popsicle. I don't apply it directly on the lips. Just a little dab using my fingers. 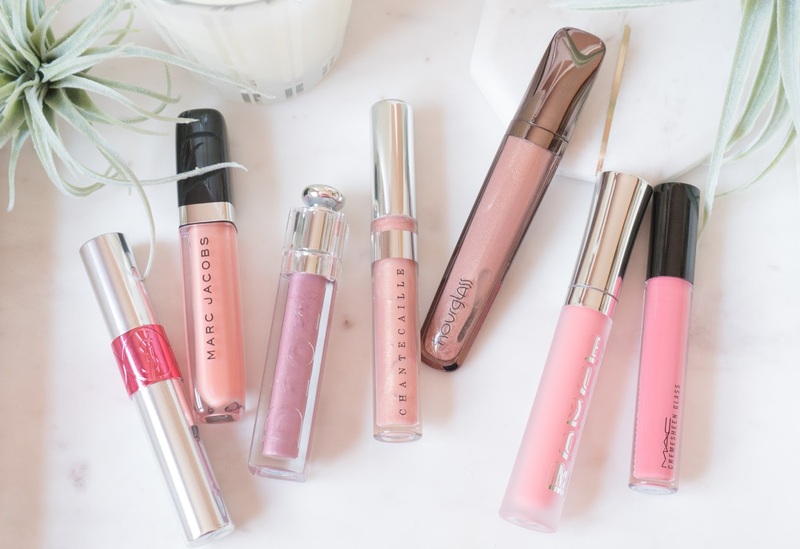 For the lip gloss, apart from the usuals, that I shared in my Spring Edit, the only new addition is the Fenty Beauty Gloss Bomb in Fenty Glow. It is such a gorgeous shade. Pretty universal. Works as excellent lip stick topper. 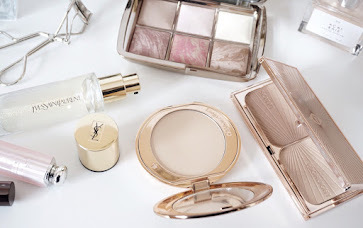 Lastly, for everyday easy wear, YVES SAINT LAURENT Volupté Liquid Color Balm in shade 11 Hook me Berry. This is another new release and I love the way it applies on the lips. It is a liquid balm, that is not crazy glossy or pigmented and makes the lips feel cool, not tingly. Very moisturizing and lasts for couple of hours before I need to reapply. Very beach friendly in my opinion. Then there are some essentials like Setting sprays and mists. 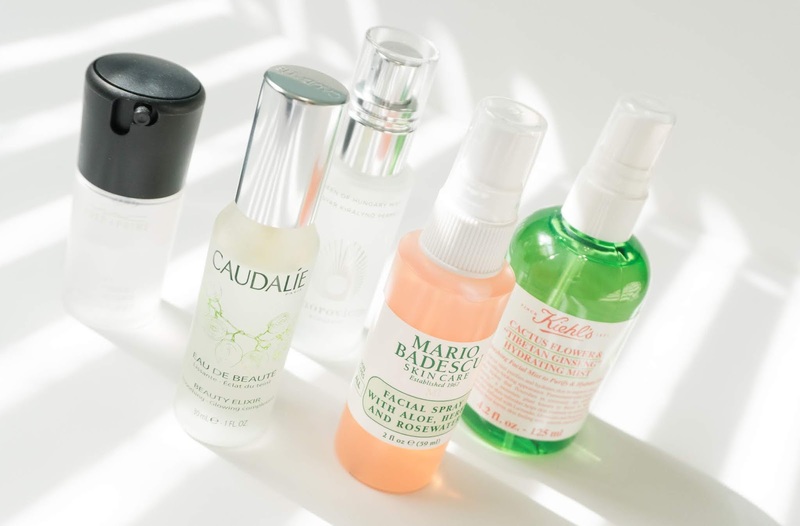 I love the Caudalie Beauty Elixir, KIEHL'S Cactus Flower & "Tibetan Ginseng" Hydrating Mist, very cooling, refreshing and hydrating. 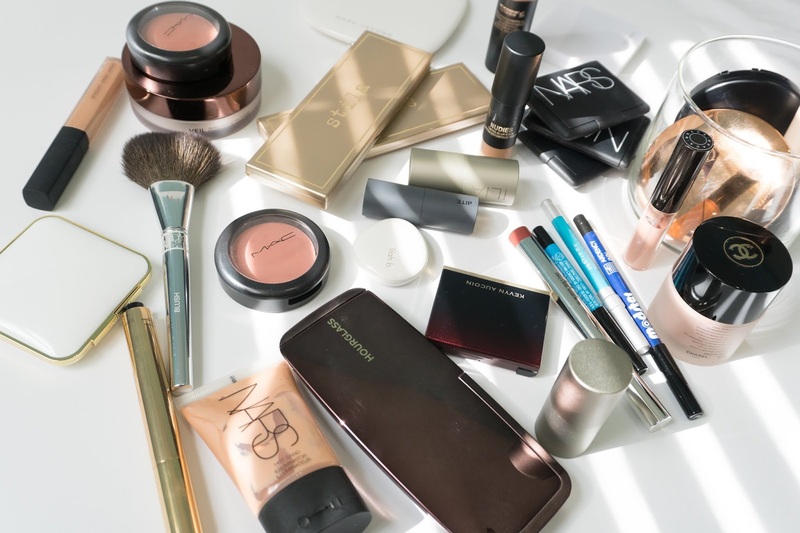 MAC Fix Plus for setting everything in place. 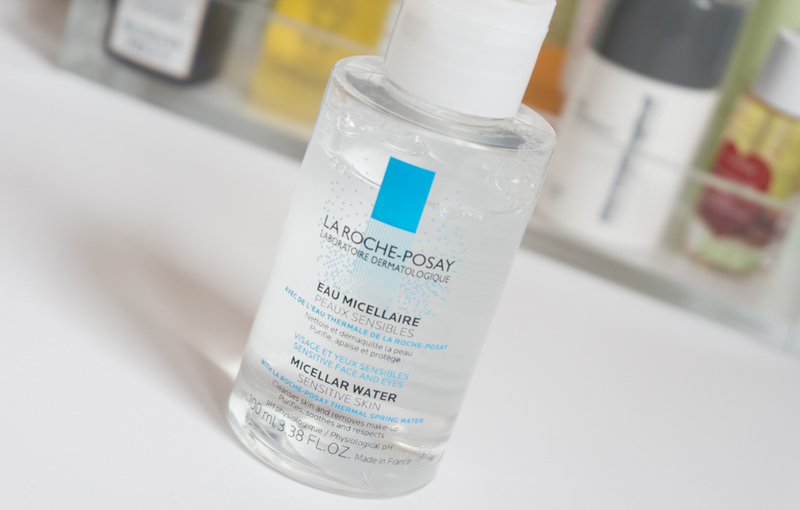 Mario Badescu Facial Spray with Aloe and Rose Water is lovely and affordable. Omorovicza Queen of Hungary Mist is a cult classic. This is new to my collection this year. This is pretty expensive and I am curious to see how different it is from my other mists. A review to follow soon. 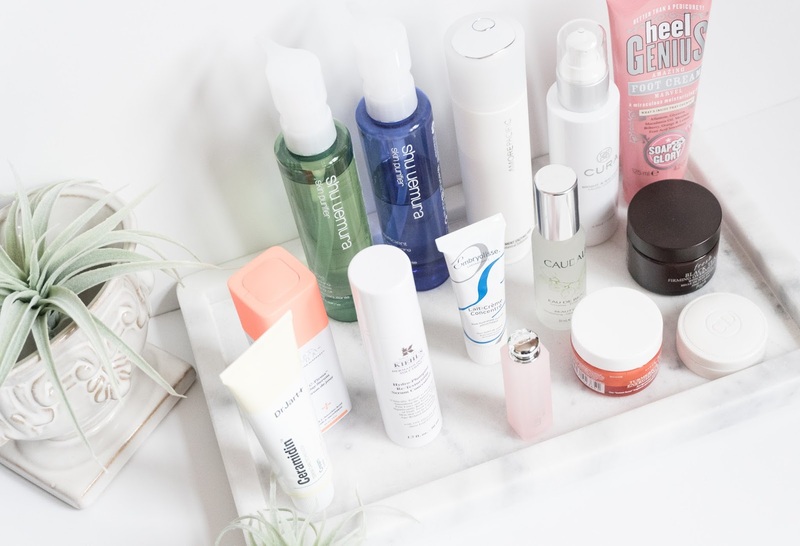 These are a lot of products for one season but it is hard to narrow down to few products, especially when you have a big collection to choose from. 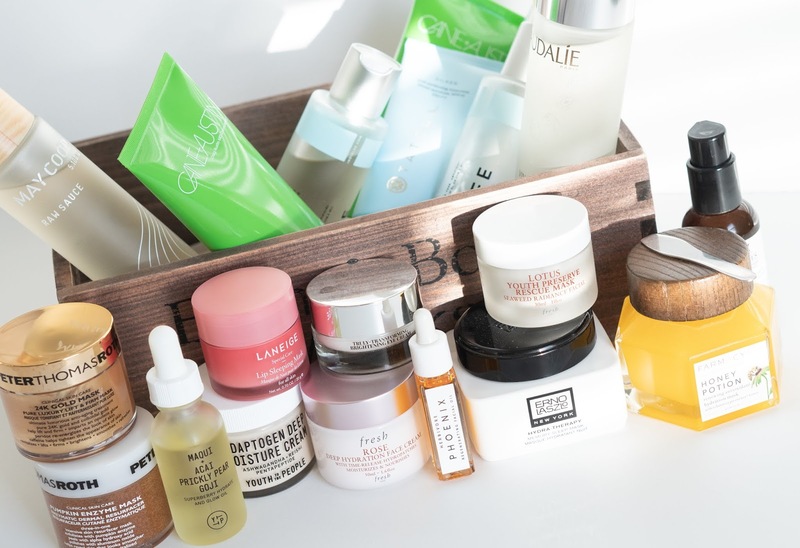 The whole point of this post is to share my favorite picks for summer. I don't use everything at once. These stay on my top drawer. This by no means is a capsule collection, though I do plan to do one in near future. I have been seeing few of my Instagram friends sharing their capsule collections and I would love to do that sometime. 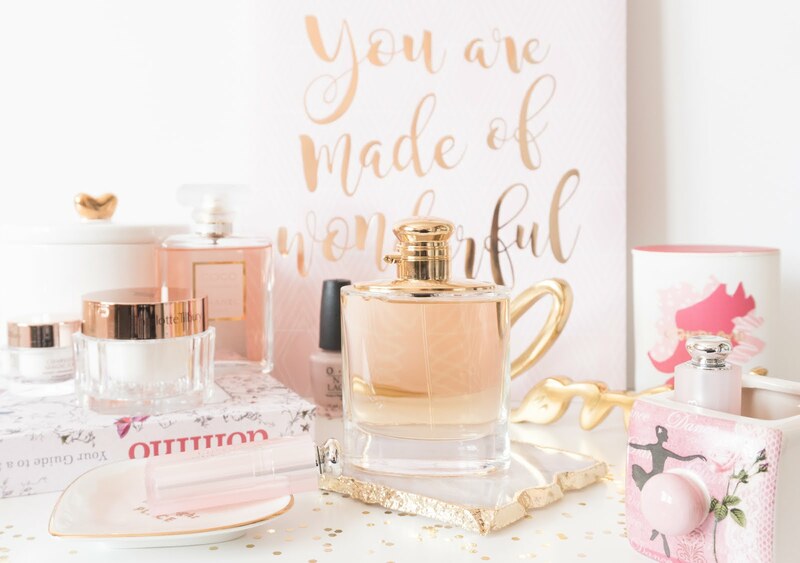 Do you spot any favorites from this huge list of products?